Update Jan 4, 2018: having just watched an MSNBC video and with the spurring of Michael Wollfe's new book Fire and Fury: Inside the Trump White House, the June 9, 2016 meeting between Trump Jr, a Kremlin-linked lawyer and others has been identified as beginning at 4:00 pm edt. Finally I can set up a horoscope with what is reported to be an accurate time of the meeting. If anything interesting comes of this I will soon write a new post for Stars Over Washington. In the mean time, the post below with transit Mercury (meetings, discussions, offspring, etc) conjunct Trump Sr's natal Taurus Midheaven (of course Trump Sr knew about the meeting!) will stay in this spot. On July 9, 2017 The New Yorker published The Truth Behind Donald Trump Jr's Meeting with a Russian Lawyer. Meanwhile, I'm still searching for an accurate birth time for Jr., a fellow some call the 'Fredo' of the Trump family. Trump Jr's recently disclosed meeting with a Kremlin lawyer who allegedly had 'dirt' on Hillary Clinton to share in order to 'help' the Trump campaign took place in New York at Trump Tower and was also attended by the Trump campaign's Paul Manafort and Jared Kushner, the son-in-law and senior adviser to Mr. Trump in the White House. A chart factor of note when looking for significators of a meeting on a certain date is planets conjoining (meeting) and when we peek back at June 9, 2016 ('noon'; exact hour unknown at this point) we find two indicators of encounters--in mid-Virgo, Jupiter conjunct North Node (a joining point of encounter), and a close Sun-Venus conjunction @19Gemini14/59 with Venus possibly the lady lawyer involved. 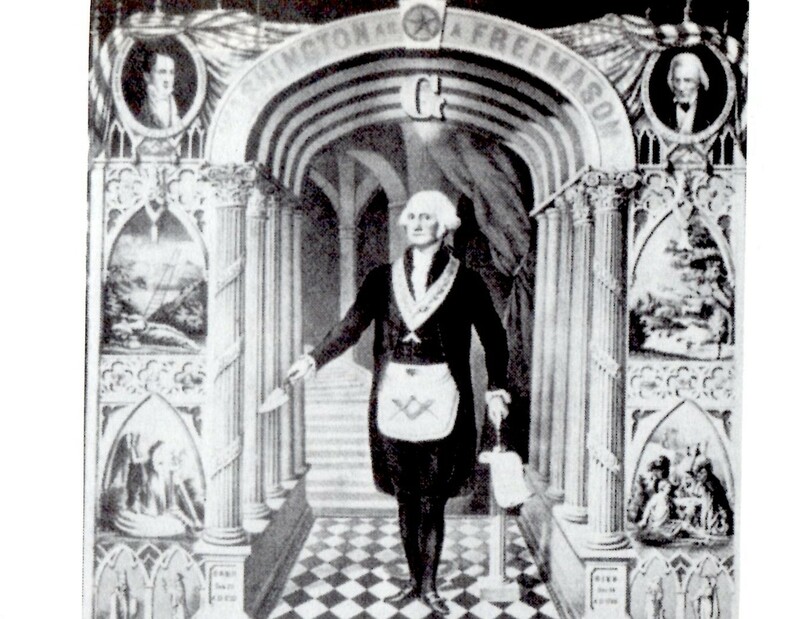 Both Jupiter and Sun can represent a leader like Mr. Trump with astrological Jupiter adding money, corporate, and political facets to the picture, and of course, both planets can signify father and authority. 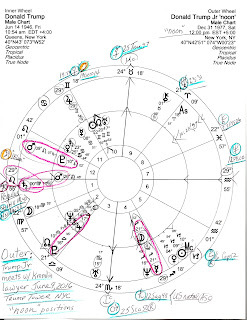 That Trump Jr, possibly represented here by Mercury @25Taurus or the opposing Mars @25Scorpio Rx (their opposition conjunct Trump Sr's MC-IC axis!!) said his Dad did not attend the June 9, 2016 meeting seems doubtful since both Jupiter and the Sun were 'meeting' with someone that day which happens to be the first day Mr. Trump began tweeting about Mrs. Clinton's 33,000 'missing' emails (that he publicly asked Russia to locate via hacking). Besides, Mr. Trump is known to be a micro-manager which makes it doubtful that he didn't at least know about the meeting in Trump Tower and may have ordered it. 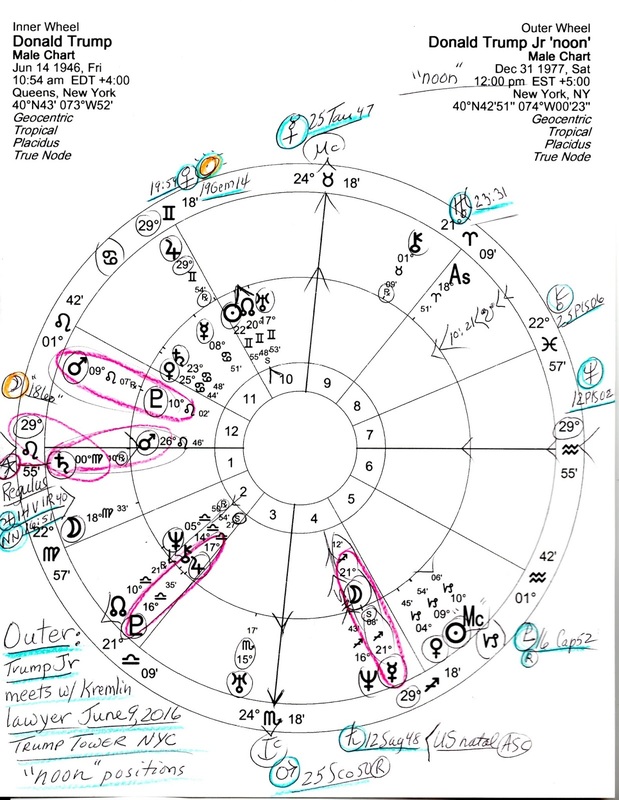 In the bi-wheel chart, below, you see circled in red the strongest contacts between Trump Sr and his namesake son including Jr's Saturn Rx @00Vir10 which conjoins his dad's natal Ascendant with Trump's rising Mars @26Leo nearby. And of course, there's royal Regulus @00Virgo sparkling among their Mars-Saturn-ASC trio and cautioning them to avoid taking revenge against others lest they lose what they've gained so far. Significantly, the issues we see now in the news may be merely a warm up for the effects of the August 21, 2017 Total Solar Eclipse @29Leo (conjunct their Mars-Saturn-ASC trio and Regulus), aka, The Great American Eclipse. Will Mr. Trump the Elder be implicated more fully in Jr's Kremlin lawyer meeting? Well, Donald Trump's natal 10th house Uranus-NN-Sun trio in Gemini (17-23Gem) was activated on June 9, 2016 by the 'visiting' Sun-Venus conjunction, another suggestion of encounters. Perhaps the reported email chain of their discussions about the seemingly shady meeting will reveal some actual facts! 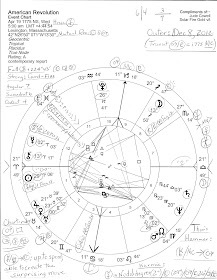 Now is it curious that the July 9th Full Moon @17Cap09 conjunct spying saboteur Pluto on Sunday, the day Donald Jr spoke up about his meeting, is an astrological echo of the RNC 2016 Full Moon which illuminated--met with--America's natal Pluto? Astro-Note: concerning Donald Trump Jr's natal planets (Dec 31, 1977 NYC; Sun Cap-Moon Virgo all day), we see that his Mercury-Neptune conjunction (16-21 Sag, Mercury stationary direct) echoes his father's problematic Mercury-Neptune square and Jr's Mercury in particular conjoins his father's Moon-SN conjunction while opposing dad's Sun-NN-Uranus trio of shocks, publicity, radical politics, and personal unpredictability. With Mercury-Neptune challenges, truth is not this family's forte (they think it's okay because 'everyone lies'). 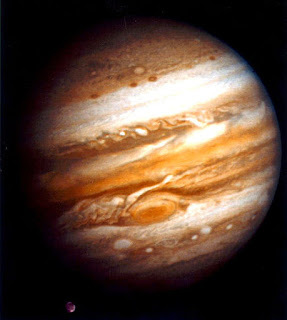 However, transit Saturn, karmic planet of realism, truth, accountability, and loss, is in process of hitting their charts in the area of 21/22 Sagittarius, a transit which also activates fixed star Ras Alhague which creates a complex set of energies, cosmic and earthly, that will not be easily resolved.